It's been a long time since I've been this excited about any game. 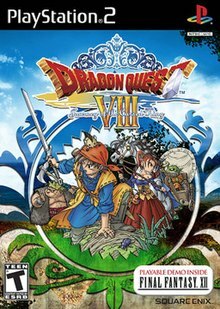 I loved the 3DS remakes of VII and VIII, but those were still reincarnations of old adventures. I wasn't horribly excited about IX; I didn't have a DS when it was released, and it ultimately ranks low on my 'series favorites' list. That means it's been almost 14 years (the original release of VIII on the PS2) since I've looked forward to a game so much. I've probably watched the Happy Console Gamer's review of XI (below) five times already in preparation. Though he's generally positive and upbeat, his extra affinity for the Dragon Quest series in particular really shines through in his videos. I might be over my head - and my free internet's 5 mbps bandwidth - but I'm looking forward to streaming a little and have prepped my Twitch channel appropriately, and maybe even taking a swing at a full YouTube review. That's how excited I am; all my inherently lazy tendencies have been replaced by visions of digital grandeur! Why, I may even put away the PS2 and PS3 for awhile; I certainly won't be needing either for the next 100 or so hours of gaming.